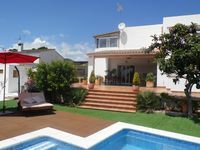 Sitges villa just 2 minutes walk from the beach. Property 2: Sitges villa just 2 minutes walk from the beach. Property 5: Spacious 53m2 Chalet at a Campground with TONS of Amenities! Villa Castillo Tamarit, sea views, free WiFi. Property 21: Villa Castillo Tamarit, sea views, free WiFi. Property 23: 'Casa en la montaña' Casa Dos Soles "
The house was very nice and clean. It had everything we needed and Orlando was very responsive and helpful the whole time. I would definately reccomend this property. Great property in a quiet location. Close to the beach and local amenities. In the summer months can get hot as the house does not have any air conditioning.